SolSuno Sun Monitor LED Watch | OhGizmo! In keeping with the trend of making watches ever more complicated to read at a glance the SolSuno uses 138 different colored LEDs (green, red and yellow) to display the hours, minutes and seconds as well as the week, day, month and year. Apparently the whole interface of the SolSuno is based upon the movement of the sun and earth which has of course been used to tell time since telling time was invented. So technically the watch can also be used to monitor the position of the sun if that’s an important feature to you. Why that would be more important than say hands or digits on the display is beyond me, but at least the watch does look unique. 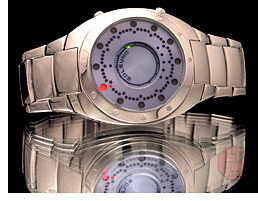 The SolSuno watches can be purchased directly from SolSuno and retail for about $280 for a stainless steel version to about $470 for a gold version. (After currency conversion.) Oh and if you’re interested in seeing the exact opposite of Web 2.0 design make sure to check out the SolSuno website. Aaaaagh! That website! I had to run and check a calendar to make sure I hadn’t suddenly warped back to 1994. Oy, using that rainbow text should require some sort of disclaimer, or at the very least, an apology. The LED Watch Superstore is an authorized vendor of the Solsuno because they have a direct relationship with Zeon HK and Zeon UK, which is the source manufacture of the Solsuno watch. Such a huge selection of funky wrist chrono gadgets.